Summer is in full swing, and that means weekends by the pool and days at the beach. It also means you may be asking yourself “Is it time to for a Philadelphia bikini wax?” If so, Body Restoration wants to help. The website Bustle offers these summer waxing tips. As anyone who’s watched Seinfeld can tell you, double-dipping is bad etiquette. It’s true at a social gathering, and it’s true when you’re getting a bikini wax. If you’re searching for a bargain-priced Brazilian bikini wax, keep in mind that a place can’t possibly have hundreds of sticks at their disposal. If they did, they wouldn’t be able to make enough money to stay open. The waxing at Body Restoration spa is priced accordingly so that you always have a clean and efficient waxing experience. We never double-dip our wax sticks, so the wax itself is never compromised. You’ll never receive a wax where the wax has been double-dipped with the same stick after touching someone’s skin and hair. Why Do We Use Two Different Waxes? Ever wonder why we not only use the Blue Wax (hard wax) which hardens and is removed by hand, but also a soft wax that relies on strips to remove it? The Blue Wax is formulated for coarse hair. It grabs thicker hair better than the soft wax, and it is reserved for areas where there is coarse hair like the bikini line on the under arms. It can also be used on the chin and on the upper lip especially in the corners of the mouth where hairs can be short and difficult to remove. 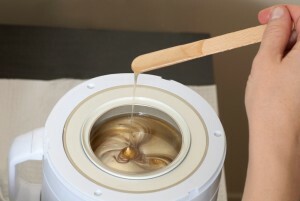 The soft wax is reserved for larger areas of the body like waxing a man’s back, or full legs or full arms. It is applied in a thin coat and a non-woven strip is placed over it to remove it. It is formulated for fine hair or thinner hairs that the Blue Wax will not grab. The soft wax adheres better to fine hairs that need something stickier to remove them. If you’ve had Brazilian waxes and the hair on the bikini line has become so fine that the Blue Wax will not grab some of them, we can switch and use the soft wax on the area. We would attempt the whole area with the Blue Wax and then follow up with soft wax if needed. It saves a lot of time that would be spent tweezing if the hairs had thinned out so much that the Blue Wax wasn’t removing them. Using the soft wax for follow-up pulls will not hurt at this point in the service because 95% of the hair is gone. We are just making one more pull with a stickier wax to grab those last few hairs. Posted on July 15, 2015 February 9, 2016 Author bodyrestCategories WaxingTags bikini wax, blue wax, spa wax, WaxingLeave a comment on Why Do We Use Two Different Waxes?